The long weekend gave me the chance to finally write a blog post. I will try my best to be more frequent with posting new content. This blog is going to be short one. We had multiple projects running and we had to design a way why which each project can easily identify their variables. We decided to name our session variables after our short project codes. My project code was "1ADM" and OBIEE didn't like it when I used the varaibles whose names started with numbers. I am writing this blog after a loooooong gap and I can tell you that it is worth the wait. In this blog, we discuss about the process of setting multiple values to a presentation variable through goURL. This blog also introduces the concept of CONDITIONAL FILTERING in OBIEE. Ok call me a geek for writing this blog on new year's eve, I dont care :-P. I can tell you that this blog is totally worth it. We know that EM can be used for deployment but we had a requirement to maintain an automated log every time a deployment is done with mandatory comments from the developer and link the deployment to a backed up RPD so that we can keep a track of the changes been done to the RPD and revert back if necessary. I developed the Multi User DEPLOYMENT (not Development) tunnel a.k.a neo-MUD tunnel utility to meet this requirement. We will talk about the process to implement the neo-MUD tunnel in this blog. We know that we can perform outer joins in OBIEE in the Logical Layer. The problem with this mechanism is that it is not possible for one logical table sources (LTS) to join to a fact by an inner join and the other to join to the fact by an outer join. Let us try to solve this problem here. My last article talked about a maintenance and hassle free mechanism to implement security. The article moved the security architecture to roles created in EM. The next logical step is to move the roles from one environment to another because lets face it, manually creating roles is a lot of effort. This blog talks about a hassle free mechanism of OBIEE security implementation with almost zero overhead. We will first look at the data level security implementation and then extend it to object level security. We recently had a requirement that the button sizes in OBIEE had to be increased. The reasoning was that the users of some of these reports are old and they hate smaller sized buttons. Now we know the properties of buttons such as the size are set in the css files which together form the skin. While it is possible to copy the skin and then edit the desired property, it is a long process. This blog talks about a shortcut to achieve the objective. Users often have the requirement to have the selected prompt values suffixed to the name of the exported file. This blog talks about a hack to achieve this in OBIEE. The most skilled task in the world of Oracle Business Intelligence is to design and code the RPD. While we are all aware of the general concepts of Business models, logical tables, joins and hierarchies, the RPD is essentially a query generating tool. The query generated by the tool depends on a sound understanding of the business model and data warehousing concepts. The most trickiest part of RPD development is to ensure that OBIEE generates a tuned physical query. I wish to write a series of articles that show the impact of coding something in the RPD on the Physical query and would hence enable the developers to find out the best things to do from a performance stand point. Please note that this article does not recommend one query over the other as the efficiency of the query will depend on the data structures themselves. The intention of this blog is to study the impact of changing the RPD on the Physical SQL. This is the first article in this series and we will be talking about the scenario where we pull columns from 2 different physical sources and 1 common dimension in the same analysis. We know that we can use the evaluate function to call any function stored on the database and pass arguments to it. What if we have a requirement to use different database functions for the same column based on different selections made by the user. This article talks about a method to handle this requirement. We had a requirement of tracking a query fired from OBIEE. This was to help us find out the Analysis that consume the most database resources. It is possible that some user might be selecting a huge date range resulting in the problem at the database. So the trouble in this case might be the filters put by the user and not the Analysis itself. OBIEE 11g client tool is not certified with Windows 8. The certification matrix for OBIEE version 11.1.1.7.0+ is in the following location and it does not include Windows 8. It means that installing OBIEE 11g client on Windows 8 is not supported by Oracle. I got a mail from Oracle to explicitly call it out. This blog talks about a way to to install admin tool on Windows 8 machine. We had a strange requirement. The user did not want the dashboard to be published and he hated the fact that he had to expand the dashboard to see the pages in it. Since the requirement is strange so will be the solution. While we all know about using conditions on sections in a dashboard, and while we all have used presentation variables to show or hide a report using these conditions, this blog talks about a process to use conditions on sections to implement a 3 way decision rather than just a boolean (true/false) decision. This blog talks about a quick way to create BIP reports on top of OBIEE dashboards. SQL query is often used as a data source in BIP and often we have a requirement in which we have to use one table when the user selects a certain value in a parameter and select a totally different table when the user selects another value in the parameter. While we have discussed a method to do this using pipelined functions in http://obiee-oracledb.blogspot.com.au/2011/07/performance-enhancing-drug-called-table.html, this blog post talks about a BIP 11g method of achieving the same result. I was recently involved in a project implementation on OBIEE 10g. The dashboard had a multiselect and the values in the prompt were huge. The standard width of the multiselect was making the user uncomfortable since a large part of the value was hidden due to the small size of the multiselect. This blog talks about a method to fix this problem. My client wanted to hide some of the reports from the users and release them at a later date. The however wanted a set of users to have the privilege to see hidden objects. Let us see the process to achieve this objective. This article introduces the concept of Smart Tables in OBIEE. I call them 'Smart' because these tables have the ability to produce different data on the fly. These can morph themselves according to the user requirement. Smart Tables also make the data model dynamic in nature as a Smart Table can change characteristics on the fly. Let me now explain the procedure of implementing Smart Tables. This is an awesome feature in BI Publisher 11g but I do not hear a lot of noise about it so let me create some. I'm talking about Event triggers in BI Publisher 11g. Using event triggers, we can conditionally stop the delivery of a report. We will see the process of skipping schedules in this article. This is a discovery more than a solution. OBIEE 11g lets us use Hierarchical column as dimensional attributes for charts. I had a requirement to indent the levels in a hierarchical column. The solution isn't really innovative but I thought of sharing this because finding the option can become a treasure hunt. This post focuses on the Environment variables as they are vital in coding conditional statements. In the BI world, we talk about measures and aggregation but we don't talk a lot about string aggregation. String aggregation is about concatenating strings for a certain dimensional value. Let me give an example. Let us say that we have a purchase order (Lets call it PO1) raised for a set of items (Lets say I1,I2 and I3). Lets say that the supplier does not have I1 in stock and wants a larger order quantity for I2 to make the shipping viable and the supplier feels that I3 can be shipped. The store manager might want to see "I1 out of stock, Order quantity of I2 is too less" against PO1. Question is, how do we do it? This blog talks about the process. This blog talks about the process to use DB Links on OBIEE. This is another one of those articles where I pick a topic from the sample chapter of my book and share with you. Some of the other discussions in this blog from the sample chapter of my book are on dynamic breadcrumbs, data densification and ReForms. In this post, we will see 3 different ways of creating a Matrix report a.k.a Crosstab report a.k.a Pivoted report. My book also has a number of recipes about consuming and creating web services. Check out a brief description of the book and the table of contents. You may also check out the online application build on top of the discussions in the sample chapter of my book. Let me begin by defining a ReForm. A ReForm is an amalgum of Reports and Forms and has the DNA of both. This discussion not only presents a ReForm but also demonstrates the enormous benefits of using JQuery in APEX report development. Data is often stored in sparse form and business often wants to see data in a more organized and explicit fashion. Report developers working across reporting technologies face a requirement to show a record with a '0' in the measures columns if no data exists for a particular combination of dimension values. For such a requirement, we will have to densify the data and this article presents a way to densify and aggregate on the fly. I wish to state that this article is borrowed from my book on Oracle APEX 4.2 Reporting. You can check the table of contents and a brief description along with screenshots. 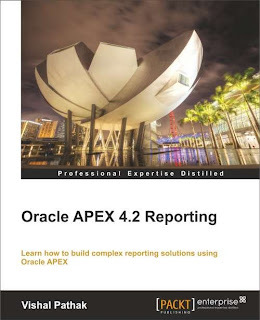 This article is borrowed from one of the topics of my book (http://www.packtpub.com/oracle-apex-4-2-reporting/book) on Oracle APEX 4.2 reporting. Check the chapter by chapter description and the table of contents to know about the other discussions in my book. I wish to talk about the process to engineering breadcrumbs of varying lengths in this article. Let me explain the motive with an example. I faced a rather strange but relatively simple requirement a few days back. The client had employed a resource to refresh the sessions page and capture the running queries from it and mail it to a team that dealt with performance tuning. This is certainly not the most efficient resource management. It is strange that OBIEE has an elaborate mechanism of Usage Tracking but this system does not capture the running analysis. It captures the info only after the queries have fetched the desired results and not while they are still running. This post talks about devising a programmatic way of capturing the info about running analysis/reports in OBIEE 11g. Such events are indeed rare and few in India. Really hope this to be a trendsetter. This article is in continuation of my previous work on Oracle Map Viewer/Map Builder and Oracle 12c database. This article demonstrates the conversion of ESRI maps to datatype (SDO_GEOMETRY) that can then be used in Map Viewer. The article ends with an HTML code that can be put in APEX's HTML region to display the map with ESRI info on it. Map viewer is a kool technology and I wanted to write about it for a long time. 1. Download Map Viewer and Map Builder. 2. Create a pluggable database (pdb), create a pdb user and grant the necessary privileges to it. 5. Use Map Builder to create styles and themes. 6. Get a key from google and then use it to create a map tile layer using Map Viewer. Oracle APEX 4.2 reporting is designed to bring the best of the reporting world for intermediate –advanced readers. The book is available at http://www.packtpub.com/oracle-apex-4-2-reporting/book. It is designed to expose APEX developers to other reporting solutions, inform them about the strengths of each of these and to enable them to use these technologies in APEX. The book also assists designers who wish to use APEX with their existing heterogeneous enterprise so that their existing code is reused and effort in building better business intelligence systems is minimized. The table of contents of the book can be found at http://obiee-oracledb.blogspot.in/2013/07/my-upcoming-book-oracle-apex-42.html. Let me briefly walk you through the contents of the book. This article describes a mechanism to create reports in excel using the relations established in Oracle BI Server. We can leverage BI server and the relations established in it to create quick reports in excel. The last paragraph of the article talks about using the iqy file to get data with OBIEE's formatting. This article presents a way to set SSL enabled APEX 4.1 on weblogic using APEX listener. The final part shows the process to configure standalone APEX listener and the use of Grizzly in it. I know that I am obsessed with web services, but this is my final article in the series dealing with web services.